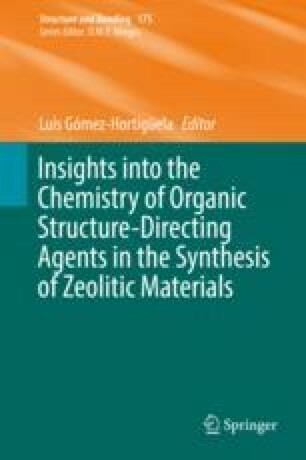 In this chapter, we delve into the X-ray diffraction techniques that can be used to address the question as to where the organic structure-directing agents (OSDAs) are located in the pores of a zeolite framework structure and give an overview of some of the practical issues involved. By examining the results of such investigations, we attempt to establish whether the OSDAs are really disordered, as is often claimed, or if it is the methods we use that give this impression. In fact, the non-framework species in the channels of a zeolite appear to be arranged quite logically in a chemically sensible manner. In most cases, the OSDA within the pores can be described well as a superposition of just a few discrete, symmetry-related positions, provided the discrepancies between the OSDA and framework symmetries can be resolved. On the basis of some selected examples, we show that their arrangements can be extracted from experimental data using a systematic strategy and sometimes supplementary information. S.S. thanks the Swiss National Science Foundation for financial support (project number: 165282) and L.M. Chevron ETC.